“I want to finish my education. My dream is to go to Europe and have a beautiful life.” 19 year old Somali woman stuck in Libya, trying to find means of getting on a boat to Europe. Throughout the world millions of workers face an uncertain future. Capitalist growth is declining and the global economic crisis is deepening. The official figure of world unemploy­ment is nonsense. The International Labour Organisation says that 200 million will be unemployed by 2017. In reality only 1.3 billion of the world’s 5 billion adults have a job with regular pay and over half the world’s population somehow survive on less than $2 per day. Unsurprisingly, even in the economic chill following the financial crash, over 3 million people a year still migrate from one part of the world to another – mainly from the poorer south to the richer north – in search of a job with a regular wage that will bring them a better life. Nothing new here. Throughout its relatively short history capitalism has created a working class from ruined peasantry and uprooted workers whose poverty has obliged them to migrate within and beyond borders. The need to travel between coun­tries to find a job emphasises the essence of the working class, that workers have no country. Together we have created all the real wealth of this system of production. But this wealth takes the form of capital and is used to squeeze more unpaid labour (profit) out of us without any concern for human needs. In times of economic crisis, capitalists have always ruthlessly expelled workers from the labour force with no care about how they are supposed to live. Today capitalism faces a global economic crisis without precedent. This crisis began long before 2007 but the bursting of the speculative bubble has created a new economic paralysis in the so-called advanced states. Despite profits running into record trillions of dollars for high-profile companies like Apple, these are far out-weighed by capitalism’s ever-increasing debt mountain (based on fictitious capital created by central banks’ ‘quantitative easing’ and multiplied by financial specula­tion) and a formidably low profit rate – which in turn is cause and consequence of the recent collapse in commodity prices. The capitalists are doing their utmost to boost the rate of profit in the ‘real economy’, where new wealth is created, by making workers do more work for less pay and generally reduce the cost of upkeep of the wage slaves. Spending on social services, education, health and welfare for the needy, and much more is being constantly slashed – all under the banner of ‘austerity’. Very few workers in Europe can now dream of a “beautiful life”. For years the European states, including the UK, more or less maintained a two-faced policy. Anti-racist legislation and opening up of borders sat easily with the gutter press and far-right politi­cians thundering against ‘asylum-seekers’ taking jobs, lay-about Roma jumping housing queues and living off benefits, whilst bosses quietly welcomed illegal migrants who can be exploited so much more viciously without being able to fight back. Today, thanks to austerity, there is a bigger pool of local unemployed and a generally lower-cost workforce. At this point in the economic crisis the bosses have less need for all but the most skilled of migrant labour. Unfortunately for the political class who have the job of guarding the vested interests of capital, the flow of migrants cannot be turned on and off like a tap. Global economic crisis means increased imperialist rivalry which has created hell in many areas of the planet. The destruction of existing state structures by Western imperialism in Afghanistan and Iraq has opened up a Pandora’s Box which is now dovetailing into the debris of the Arab Spring of 2011. This was itself a consequence of the collapse of the financial system in 2008 which has had repercussions around the world. 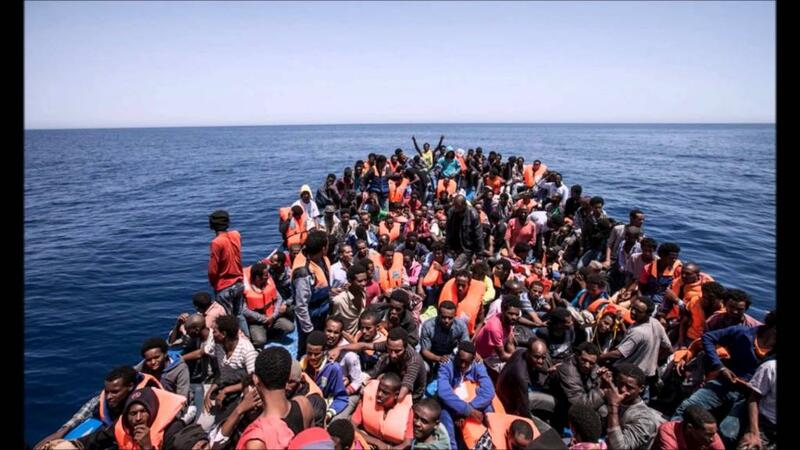 Of course if you read the Daily Mail or Daily Express etc these are not human beings fleeing for their lives. They are just a “horde” of outsiders aiming to steal what we have: our jobs, benefits and houses. On the European mainland the EU’s open border policy is breaking down (the Schengen zone) under the weight of sinister racist responses to “choke off the flow” of refugees by national poli­ticians. In Germany support for the populist Alternative für Deutschland party is growing as are attacks on refugee shelters. Out and out racism is more and more part of the politi­cal mainstream. Capitalism’s most desperate victims are being made the scapegoat for the economic crisis. Politicians have always turned to nationalism and racism to prevent what capitalists fear most, that workers should recognise their common enemy in capitalism and unite against their exploiters. The truth is that the way of life of “hard working families” is threatened, not by impoverished newcomers to the labour force, but by the constant attacks from the system that suppos­edly represents them. When it comes to politicians peddling racism and nationalism Britain is no exception. All the main parties agree that immigration must be curbed. Little Englander UK Independence Party (UKIP) go one step further and blame the EU for admitting migrants who are blamed for every­thing from the housing shortage to high unemployment. Originally the Conservative leadership thought up the idea of a referendum over breaking from the EU as a way to halt the rise of UKIP and keep their own right wingers quiet. But all this is just ruling class infighting. Like the Scottish independence pantomime, media hype around voting ‘yes’ or ‘no’ to Brexit will distract workers from the further economic misery Osborne has in store. The EU may be in danger of implod­ing but this is of no concern to the working class. It just shows how serious capitalism’s crisis has become and how much it is beyond the control of the representatives of the capitalist class. As world capitalism’s economic order implodes and its political order crumbles, the prospect for humanity is bleak. We are at a critical histori­cal juncture. Increased destitution, unemployment and wars stoked by imperialism in the pursuit of profit are all the current system has on offer. The only way out is for the world’s workers, the people who produce the real wealth, to join together to get rid of capitalism itself. This may sound like an impossible dream. But daily life itself is dispelling the illusion that there is a beautiful life ahead under the present system where 62 people reportedly ‘own’ as much wealth as half the world’s population. It’s time now for workers everywhere to stand together against capitalism. It’s time for an international political organisa­tion to revive the vision of commu­nism that once shook capital to the core. Not Stalinist work camps and endless drudgery for party dictator­ships. Our struggle is for a new world … without war, without unemploy­ment, without profit which causes wars; a world without checkpoints and borders which knows no distinc­tion between race, creed or colour; a world without social classes where human beings decide collectively how and what to produce to directly fulfil human needs.